Afghanistan Art is alive in Afghanistan! I began to learn about Afghan art when I met one of the most amazing Afghan men, M.Karim on that sunny day in 2008 when I stopped in at Karim's Bamyan Fine Art Gallery on Chicken Street in Kabul. I have been amazed at the wonderful Afghan artists I've been honored to meet, interview, and tour their homes and art studios. I'd like to introduce you to them below, and explain more about them here. Read their bios and take a look at their Afghanistan art... I'll be posting their art and making prints available soon. Read about one hundred-year-old modern-art-story of Afghanistan. I wrote down what the Afghan masters had to say at a special gathering in my home of some of the top Afghan artists in Afghanistan late summer, 2009. There are many different Afghanistan art initiatives highlighting the desires of Afghan people to express themselves through painting, photography, sculpture, writing, and art expos. If you know of art initiatives not listed here, please let me know through the form below. Read about the book, Images of Afghanistan. This is a fantastic resource describing the culture of Afghanistan today. Get to know the authors of the book, Dr. Loewen and Dr. McMichael. Additionally, my friend Joe Hoyt has put together a photography book of Afghanistan from the pre-war days. A premier art gallery located at the beginning of Chicken Street in Kabul, Afghanistan. Make sure to stop in if you are visiting Kabul! The CCAA is a unique center catering to the needs of Afghan Women Artists. Enjoy the video! A vastly improved National Museum is a wonderful place to visit down by the Palace. The Kabul Fine Art Department has over 700 students in its four-year program. Mr. Kabuli, an art professor at Kabul University, explains more about art at the school. What kinds of art are available? Hand Embroidery - thread counting embroidery is exquisite! 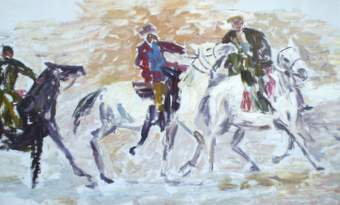 Fine Art - collage, oil, pastels, chalk, embroidery, Islamic Miniatures, calligraphy, and more! National Museum to see some ancient history - pieces dating back thousands of years are on display here! Bamyan Fine Art Gallery - the largest private gallery in Afghanistan, where you can purchase luxury Islamic art! Zardosie's - amazing fashionable Afghan clothing, handicrafts, including clothes to fit 18-inch dolls, barbie dolls, Christmas ornaments, Afghan style of course! 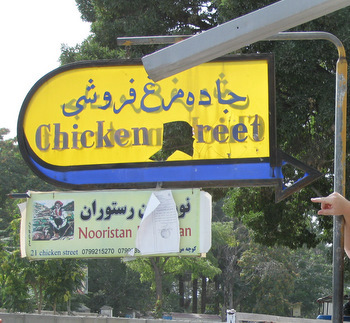 Chicken Street - a MUST if you're here - this is where you can have fun bargaining with shopkeepers, purchase handmade lapis jewelry, and of course rugs from all over Central Asia!